Don't be afraid to use black in your bathroom be brave and go dark. Don’t be afraid to use black in your bathroom. We all know bathrooms are nearly always a place which is decorated light and made to have a very airy feel to it which is normally embedded with glossy white surfaces. Even if you’re considering adding colour, black rarely is a choice that would be considered. Even though you may believe the colour black will make the bathroom look dull and boring here’s reasons why black won’t make it dark and drab but will lead the bathroom to have added depth and drama. So, obviously a bathroom that’s fully black could be a little over powering and dominating. But n the other hand, there are a variety of ways of using the colour black that makes the bathroom look incredible. As black and white are total contrasts of each other they complement each other well this makes a wonderful original and innovative look. Also, we would advise you to always add another colour as we think this softens it and the novelty of this is it could be any colour at all. The best thing about the two colours is that they allow you to accessorise with any colour at all as everything will look fantastic and appealing. To gradually edge the way into this unusual design, maybe you should consider black grout? Metro tiles are still extremely popular mainly because they can be laid in a wide range of styles. We believe dark grouts are ideal because they act as a border, this makes the tile design a lot more obvious and makes it stand out giving it a crisp look. Also as a massive bonus black grout won’t ever look dirty either. Black tiles make a statement and look dramatic and fabulous. They should be used to add a quirky edge. By going for the black tiles you’re committing to a design so make sure your certain and embrace the idea. 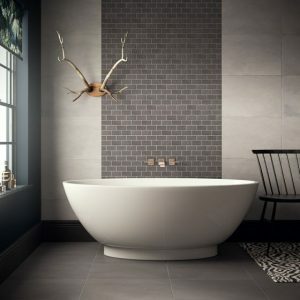 There is one downside which is if you live in a hard water area, avoid black tiles in a shower area because they will end up getting wet and then the limescale will make the tiles look dull and the only way you can keep them up to scratch and looking supreme is to constantly clean them. Another astonishing way to add black to your bathroom is by using accessories and by using this method you get an impact without having to fork out too much within reason, this can beused if the concept of black scares you a bit. For example, you could get a black blind or shutter for your window, or you could even think about a toothbrush holder, soap pump or, maybe even a bathroom storage unit? Another suggestion we would put forward is using black and copper together as they look incredible.so you could look for accessories that use these two colours.